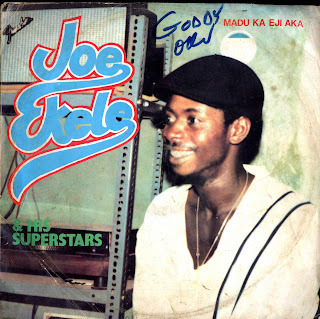 For the next selection on the highlife turntable I have chosen the track Uwa Na Ekwu Ka by Joe Ekele and His superstars off their 1979 Namaco release Madu Ka Eji Aka. I do not have any information about Mr. Ekele and the liner notes don't list any of the musicians, but I like the song. The spacey guitar lines and great muted horn solos, especially in the beginning, really exemplifies the changes the highlife idiom had undergone in the 70's. Instead of a big band approach, Mr. Ekele has reworked the amplified sound of the horn and guitar sections into a more open down tempo rhythm, that also features some super drum breaks, which all play nicely against Mr. Ekele's languid vocals. Checkout the beautiful horn playing at the beginning and the real nice horn and guitar work that starts at the 6.30 mark. Solid stuff. I hope you like it. Michael, thanks for posting this, I am really enjoying it, is the rest of the LP solid as well?